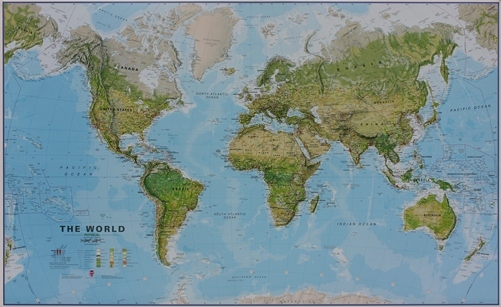 The Maps International series of wall maps represents the world’s finest collection of highly illustrated world and continental wall maps. 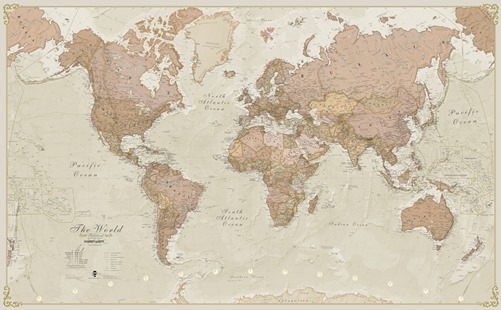 These maps combine the best features of a traditional political map with beautiful relief shading embedded in the political colouring to show the physical terrain. Brightly colored political maps of the world available in 4 scales (from 1/20 mio to 1/ 60 mio), a variety of presentations and even with the continents turned upside-down for a different approach to how the world is represented on maps! 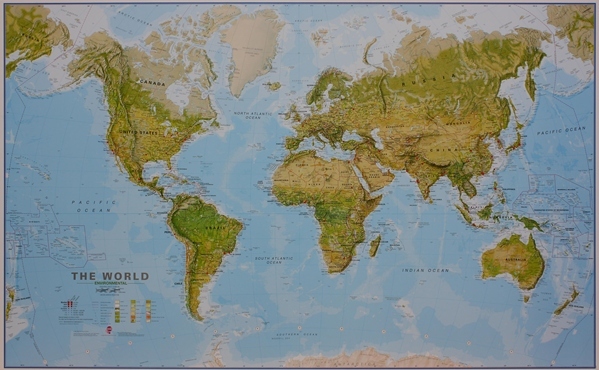 The smaller scale maps show a decorative panel under the map displaying the flags of the various countries. Countries are shown in vivid colors against light blue oceans. Country names are in large, clearly legible print. English versions for capitals and most city names are used. Within USA, Canada, Brazil and Australia internal state or provincial boundaries are indicated. Central Pacific, from Alaska/Siberia to New Zealand, is repeated on both sides of the map for better presentation of that region. The maps have well designed relief shading to show mountainous areas enhancing the overall presentation. The coloring of the oceans shows different depths. Projection is Van der Grinten. Clocks show time difference from GMT. Cities and other detail: the two larger versions (1/30 mio and 1/20 mio) have more information on them than the two smaller ones (1/40 mio and 1/60 mio) - more cities and more geographical features, e.g. rivers, etc. or framed - mounted either on pin board or on magnetic board. 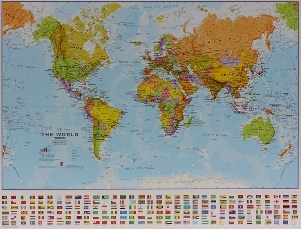 For the more professional finish, the maps are also available mounted and laminated onto magnetic or pin board with an additional choice of framing. Impressive and informative environmental maps of the world which very successfully combine physical relief with various vegetation or terrain coloring and well displayed names of countries and their boundaries. Excellent relief shading presents the mountainous areas in almost 3-D effect. Peak symbols help to identify the highest mountain on each continent or in various countries. 18 different combinations of coloring and graphics show various types of vegetation and terrain: tundra and glaciers or ice caps; coniferous, mixed or rain forests; savannah, grassland or steppe; sand or rocky deserts, lava fields and salt lakes, arable land, etc. Country names and their boundaries are clearly displayed, with town symbols indicating national and, where possible, state or provincial capitals. Within USA, Canada, Brazil and Australia state or provincial boundaries are also shown. On oceans, in addition to different shades of coloring, numerous depth figures are provided. Central Pacific, from Siberia/Alaska to New Zealand, is repeated on both sides of the maps for better presentation of that region. Clocks indicate time difference from GMT (but without the maps showing the exact geographical area covered by each time zone). Projection is Van der Grinten. Impressive and informative physical map of the world which very successfully combines physical relief with the rivers and well displayed names of countries and their boundaries. Excellent relief coloring and shading present the mountainous areas in almost 3-D effect. Peak symbols help to identify the highest mountain on each continent or in various countries. Brightly colored political maps of the different continents at various scales. 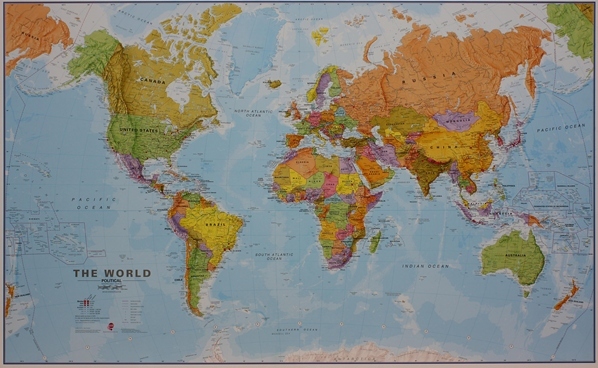 Countries are shown in vivid colors against light blue oceans. Country names are in large, clearly legible print. English versions for capitals and most city names are used, with population information displayed on the legend; international, state and disputed boundaries are displayed. Major and minor railways are indicated where possible, with some major roads also shown. 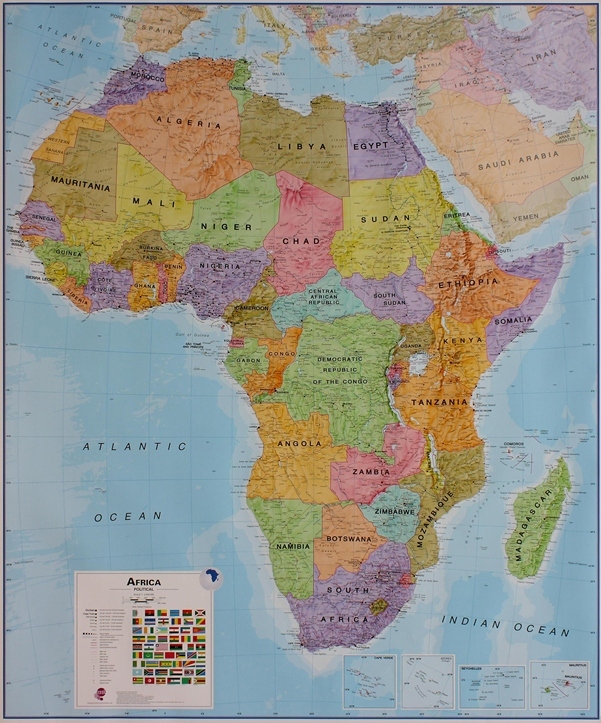 Political map of Africa at a scale of 1:8,000,000 with insets of Cape Verde, Azores, Seychelles and Mauritius. Political map of Asia at a scale of 1:11,000,000. Political map of North America at a scale of 1:7,000,000 with an inset of the Caribbean at 1:15,000,000. 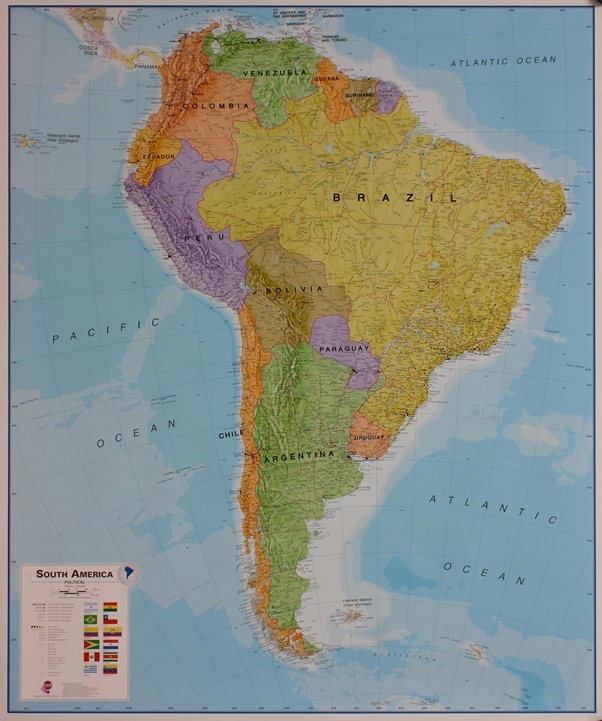 Political map of South America at a scale of 1:7,000,000. Political map of Australasia at a scale of 1:7,000,000. Large political map of Antarctica at a scale of 1:7,000,000 using data supplied by the British Antarctic Survey. National territorial claims are displayed. 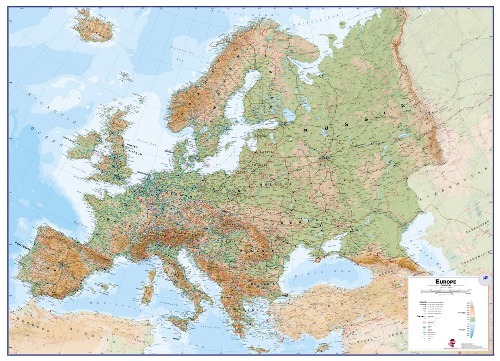 Major railways are indicated, with major and minor roads also shown; ice stations, weather stations, base camps, aerodromes are clearly indicated, as are the winter and summer extents of the ice. The maps also contain insets detailing facts, figures and information about Antarctica. Political map of Europe at a scale of 1:3,200,000 or 1:4,300,000. Impressive and informative physical map of Europe at a scale of 1:4,300,000 which very successfully combines physical relief with main roads and well displayed names of countries and their boundaries. Excellent relief coloring and shading present the mountainous areas in almost 3-D effect. 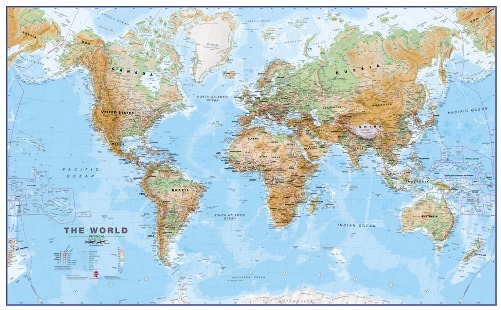 Country names and their boundaries are clearly displayed, with town symbols indicating capitals, large and smaller cities. The main roads and road numbers as well as the big rivers are also shown on this map. Political map of USA at a scale of 1:4,250,000. Political map of Canada at a scale of 1:4,850,000. 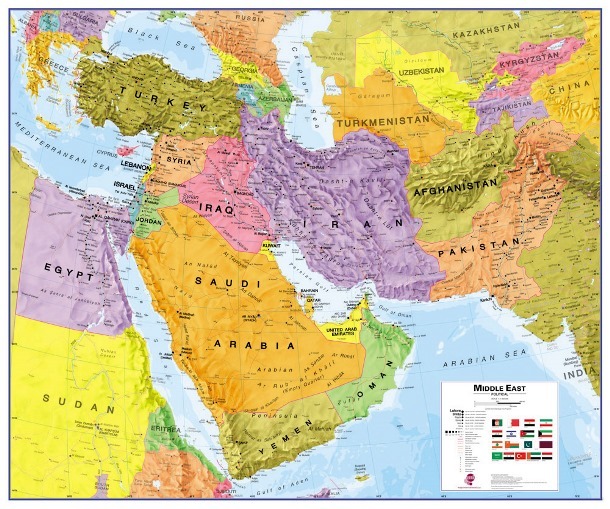 Political map of the Middle East at a scale of 1:4,350,000.